This is a little odd. I don’t know how successful it will be. 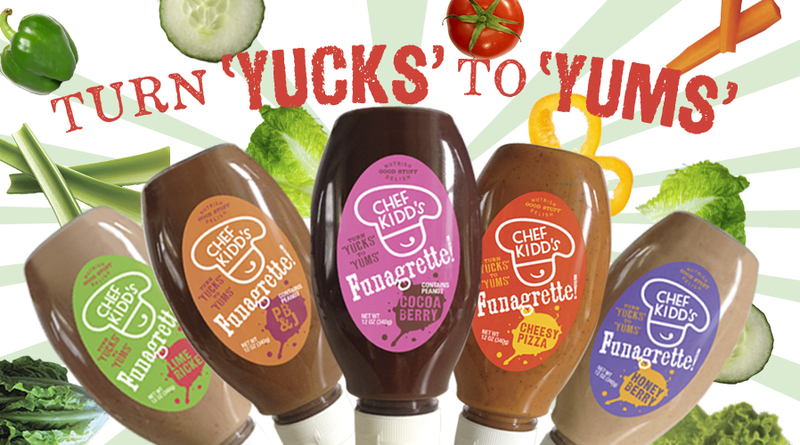 These salad dressings by Chef Kidd’s are designed to make kids eat their veggies, with flavours like Cheesy Pizza, PB&J, and Cocoa Berry. Honey Berry is the most normal sounding of the bunch. Luckily my kid already likes salad. Though I shouldn’t say that since she has a habit of turning suddenly and adamantly against her favourite foods for no apparent reason, and now I’ve jinxed it. Regardless, if she ever does decide she hates vegetables, I don’t know if pouring chocolate or peanut butter on them is really the way to bring her back around. You know what this reminds me of? This. Remember this? Just Like Mom! Those were good times. I miss the 1970s.